New Classes, Upcoming Events, Sale!!!! We will be open on Monday, January 18. 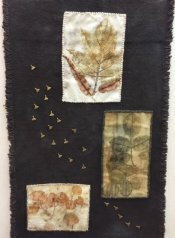 We are very proud and happy to announce that Judy Cummings, our quilting and handwork teacher extraordinaire, will be teaching Sue Spargo's "Bird Dance" at Session 1 of the Empty Spools Seminars at Asilomar, Feb 28 - Mar 4. As many of you are aware, Sue Spargo has been diagnosed with breast cancer, and has had to cancel her teaching engagements through April. Sue is doing well and is in good spirits. Sue personally selected Judy to take over her "Bird Dance" class at Asilomar. At Thistle Dew, Judy has taught Sue's "Greenbrier", "Imperial Blooms", and "Bird Dance", along with smaller projects. This year, she is teaching "In Full Bloom" and "Crimson Tweed". (These classes are both full, but we're trying to schedule some beginner classes using Sue's designs, so be sure to read future newsletters.) We know Judy will do her usual wonderful job. To see the glowing review Sue gave Judy, click here: Asilomar-Bird Dance As of now, there are still openings for the class. (I've taken classes at Asilomar, and they are wonderful.) Congratulations, Judy! We are now selling Yazzii Bags. Yazzii bags are high-quality and multi-functional. These are great bags for organizing your piecing, handwork, and craft projects, and they come in a variety of sizes and colors. I have been using one for my handwork projects, and I love it. We will be happy to order one or more for you. (It takes about 1 week to receive them, and we need a 50% deposit.) Our biggest sellers have been CA230 ($99.95), CA260 ($119.95), and CA120 ($109.95). We do have some samples in the shop. To see all the bags, click here Yazzii Bags. Blankets for Preemies, Fri, Jan 15, 11:00 a.m. - 3:00 p.m.
Handwork Sit & Sew, Mon, Jan 18, 10:00 a.m. - 4:30 p.m.
Baltimore Album, Sat, Jan 23, 10:00 a.m. - 2:00 p.m.
American Girl Doll Sit & Sew, Thu, Jan 28, 1:00 - 4:00 p.m.
Embellished Botanical Wool, Janet Paehlig, Fri, Jan 29, 10:00 a.m. - 4:00 p.m., $40, supply list. Learn to embellish a beautiful botanically hand dyed piece of wool with fibers and/or beads. Your finished piece can be used as a wall hanging, a decorative pillow, or as a decoration or embellishment on a jacket or vest. Spicy Spiral Table Runner, Martha Kunkel, Thu, Mar 24, 10:00 a.m. - 4:00 p.m., $40, supply list. We love this table runner! It's fun to make (not as hard as it looks), and the results are dramatic. It's great to make in holiday fabrics or use one of your favorite groups of fabrics for beautiful results. The Halloween version is shown her. It would be pretty with florals for Spring or red/white/blue for the Summer.